I’ve been juicing a lot lately and more consistently which has led me to have an overabundance of shredded carrot/carrot pulp! 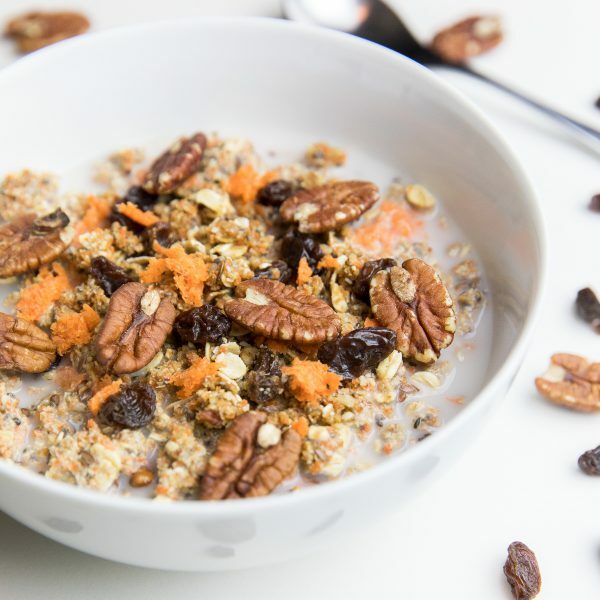 I’ve managed to use it in quite a few different ways and this raw carrot cake granola cereal is the latest carrot inspired recipe! I actually make what we call granola cereal (because we could never decide which one it was!) every week on Sunday mornings. I always let the kids pick which kind they want me to make and when I tell you this may be their favorite food EVER, it is not an exaggeration! They will even ask me every morning when they wake up “are we having cereal today?” in hopes that we will! We’ve come up with just a few varieties over the past few months….chocolate cherry, peanut butter chocolate chip, blueberry chai, loaded oatmeal raisin cookie, pineapple upside down cake…the possibilities are endless! But their favorite HANDS DOWN in the strawberry version with freeze-dried strawberries. They’ll actually ask for it every time almost! But I’m able to convince them to try something different most of the time–as was the case with this carrot cake variation! 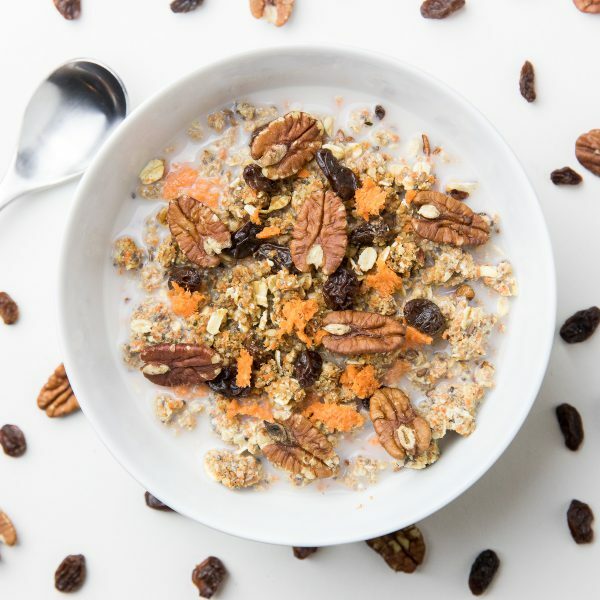 So enough about my kids, let’s get to the granola! For this version I deviated slightly from my original master recipe to make it even more healthy! I usually use quite a bit of Garden of Life Protein Powder (sometimes the plantbased meal replacement one or the Protein & Greens) and a hefty amount of melted coconut oil, but I eliminated the oil completely this time and cut WAY back on the protein powder, which you could definitely omit if you want to! 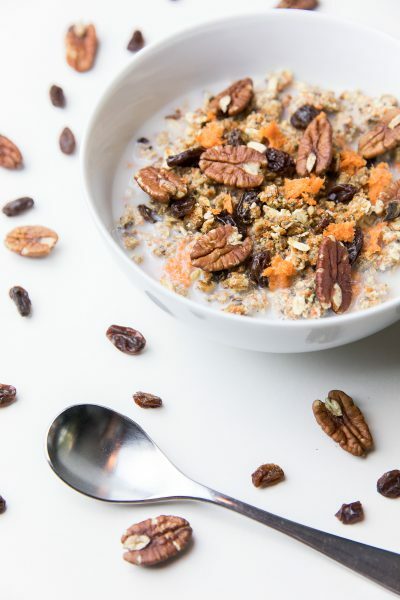 Place 3 cups oats, coconut, flaxseed, chia seeds, hemp seeds, sucanat and xylitol in a blender or large food processor and process until mixture is a fine meal. Place in the bowl of an electric mixer. Add salt, cinnamon, nutmeg, ginger, remaining two cups of oats and protein powder (if using) and whisk everything together. Add vanilla, almond butter and water and mix on low speed until well-combined. You may have to scrape down the sides once or twice. Add carrots, raisins and pecans. Mix in on low speed. Serve with milk and refrigerate what is left. 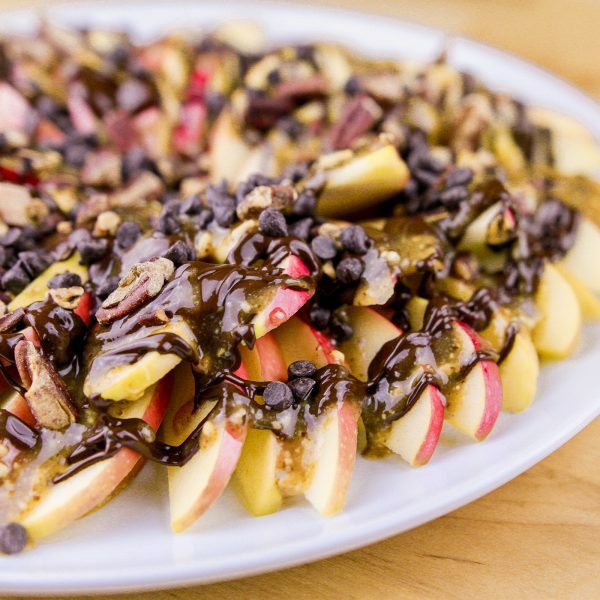 One of the best combos around is apple and caramel and you can’t help but notice those ginormous dipped apples when you go in a store like Wal-mart at this time of year. You know the ones, covered in every sugary things known to man–M&M’s, Oreos, sprinkles, candy corn, gummy bears, three different kinds of chocolate, etc, etc–yeah, those. The candy is bad enough but the caramel isn’t much better. Let’s take a peak at the ingredients…high fructose corn syrup, milk, sugar, butter, artificial flavors, palm oil and of course tons of preservatives. So essentially it’s crap. 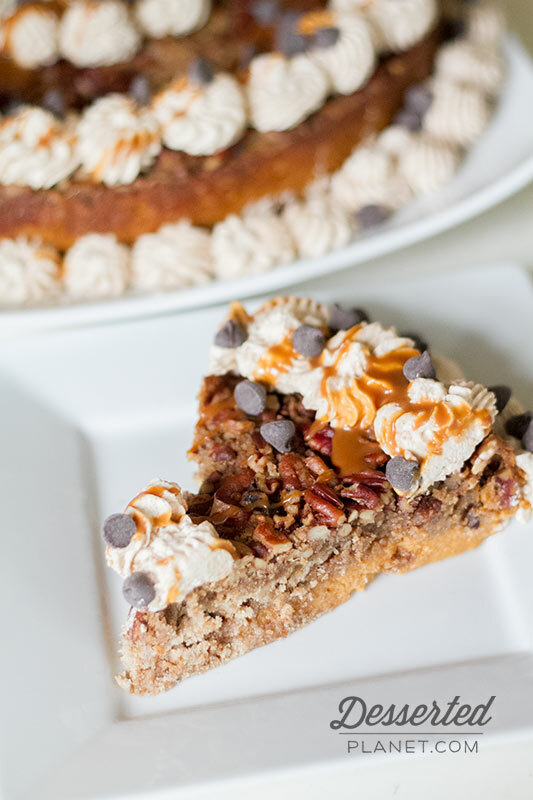 But thankfully there are some great alternatives to get your caramel+apple fix and this recipe in my opinion is better than any huge, sugar covered apple you could buy. 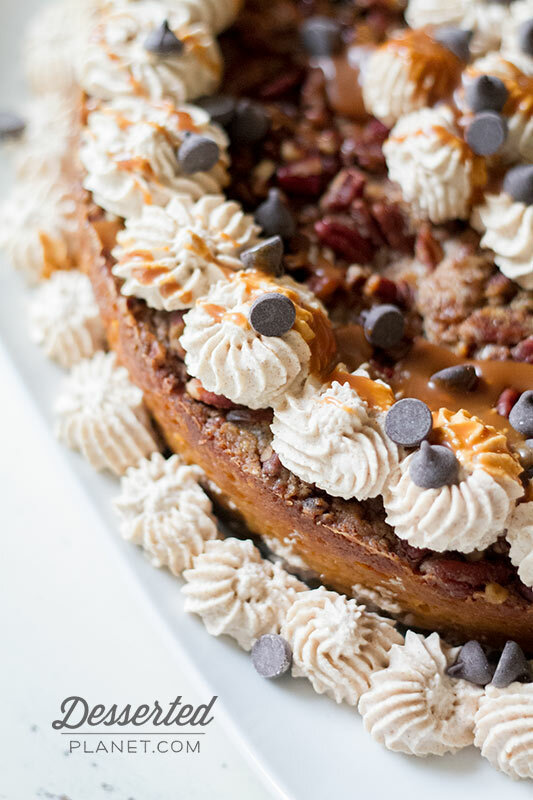 The salted caramel sauce has the perfect amount of salt to offset the sweet of the caramel and chocolate and I love the little bites of chocolate chips and pecans sprinkled over all of it. 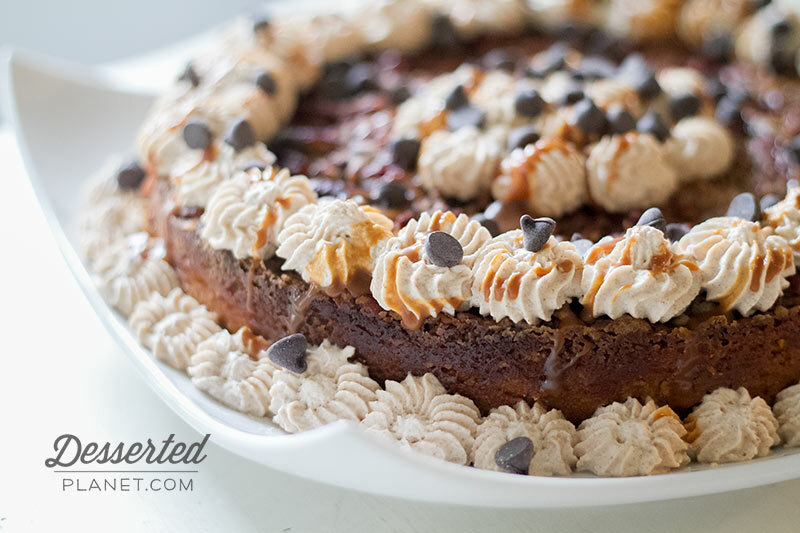 The best part of course is that it’s totally dairy and refined sugar FREE. 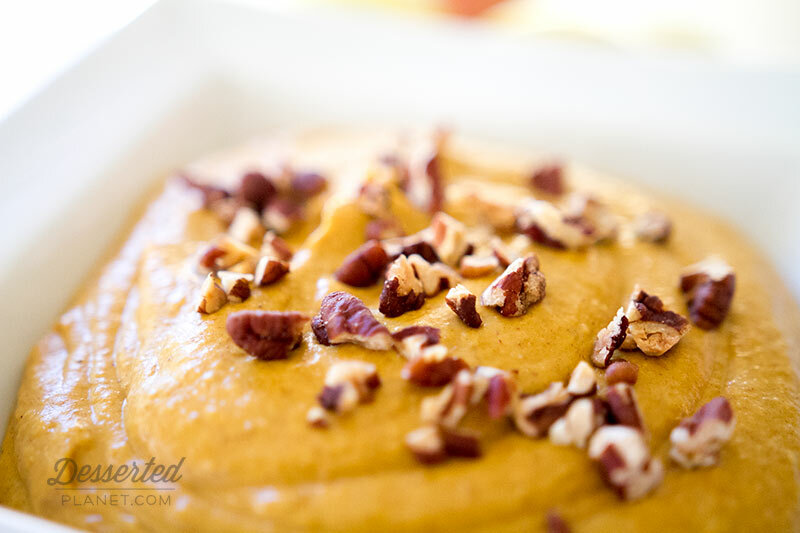 It truly is a perfect, healthy fall dessert! Add all ingredients to a small saucepan. Whisk together over medium-low heat until all ingredients are melted together, about 3 minutes. Remove from heat and let cool to room temperature. 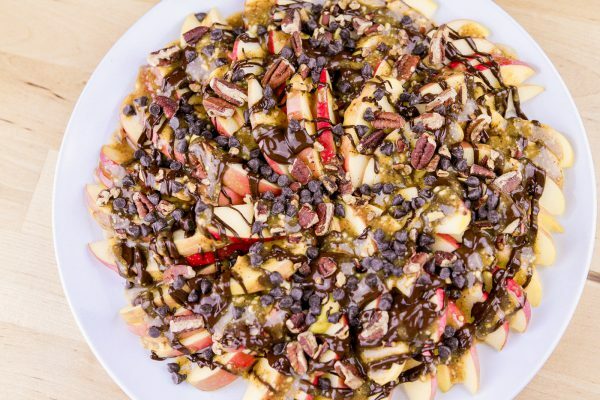 Arrange apple slices in a circular pattern on a large plate. Drizzle with caramel sauce and melted chocolate. 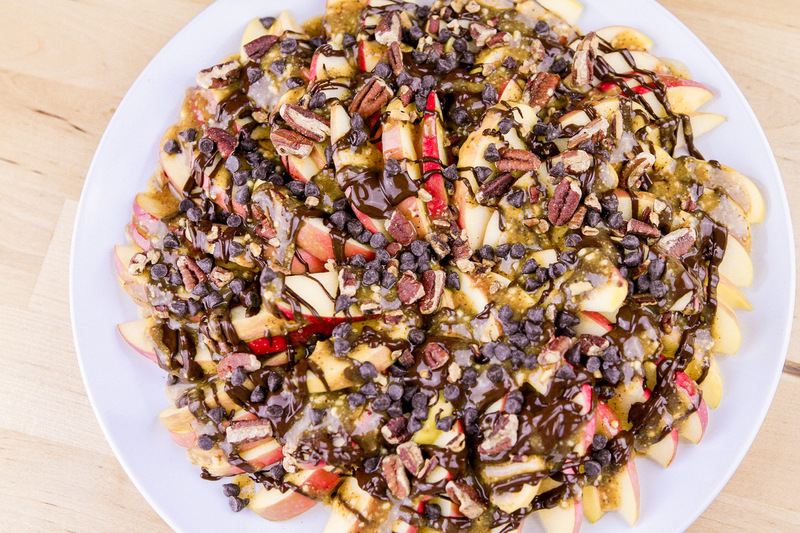 Sprinkle with chocolate chips and pecans. Put all ingredients in a blender and blend until smooth. 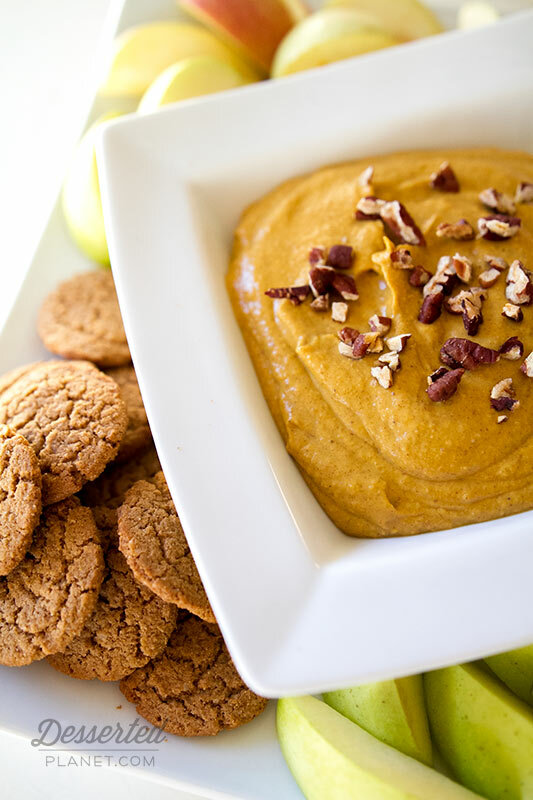 Serve with cookies, apples, pumpkin or apple bread, etc. I am into FAST recipes these days. But of course they still have to be delicious. And obviously were in the full swing of fall so they either need pumpkin or apples involved somehow. 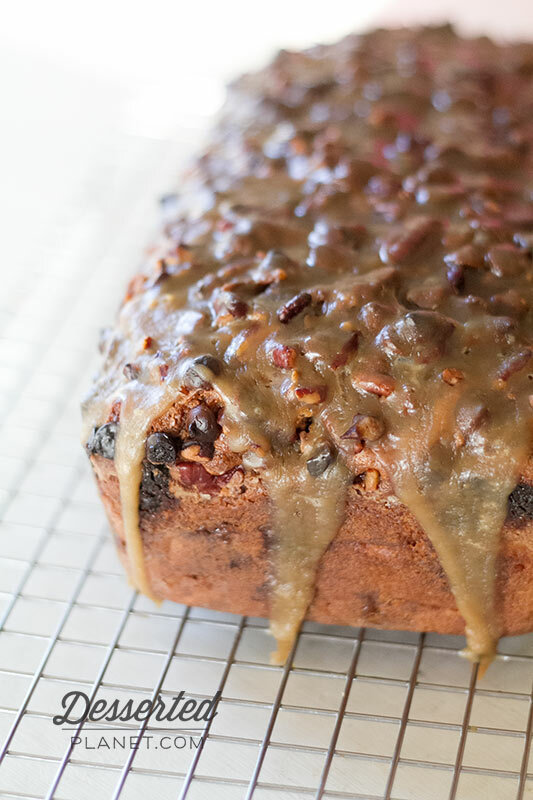 Which gives us this super moist, super yummy Praline-Apple Bread. 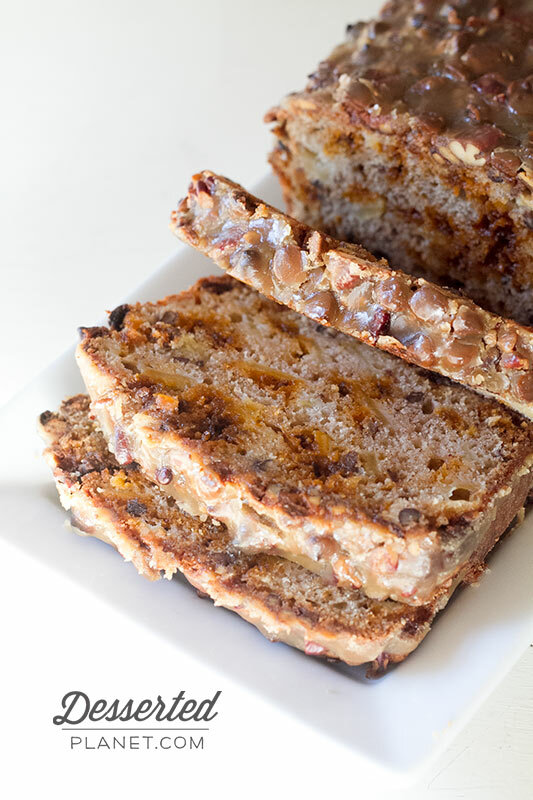 I love quick breads, especially ones that are topped with a gooey praline topping. 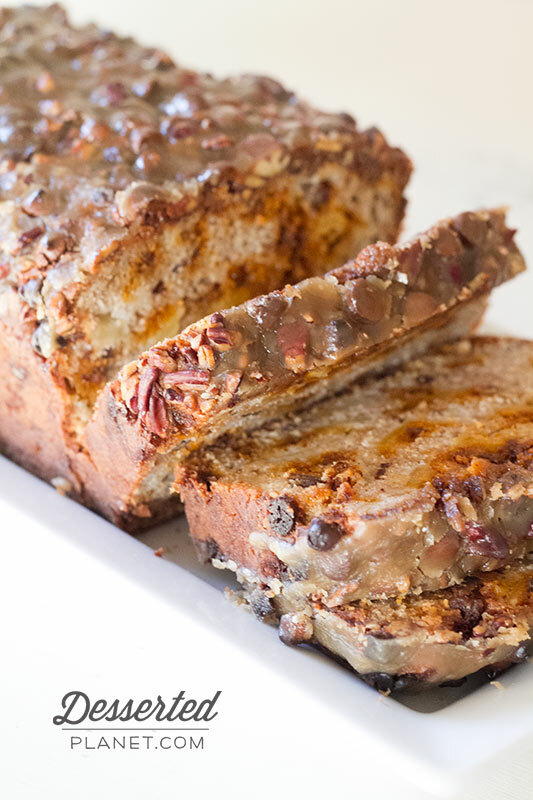 The chunks of apples, bursts of cinnamon chips and crunchy, toasted pecans make this bread perfect for a brunch, snack or after dinner dessert! I took it to a mommy/baby play date and it was almost gone by the time we left! I call that a successful recipe! Preheat oven to 350 degrees. Grease and flour a 9x5-inch loaf pan. In the bowl of an electric mixer, beat the sour cream, sugar, eggs and vanilla on low speed for 2 minutes or until blended. In a medium bowl, whisk together the flour, baking powder, baking soda, salt and apple pie spice. Add to sour cream mixture, beating just until blended. 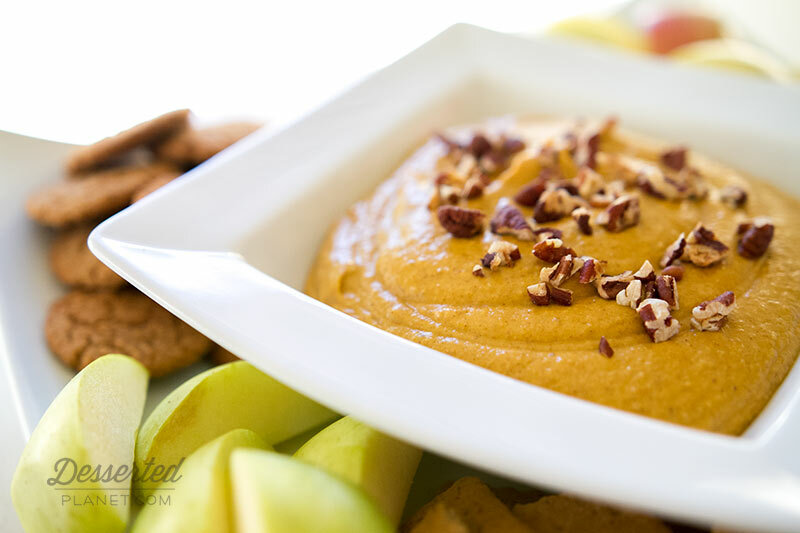 Fold in apples, ½ cup of pecans and 1 cup of cinnamon chips. 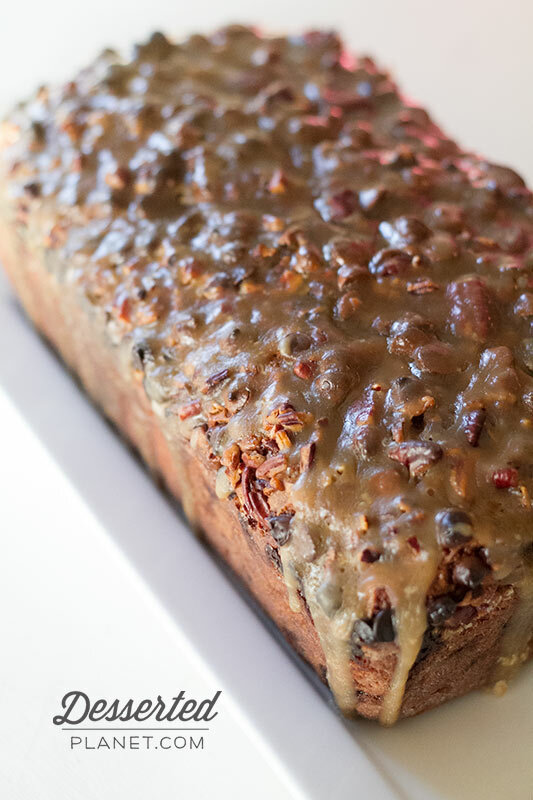 Pour batter into loaf pan and sprinkle with remaining pecans and cinnamon chips, lightly pressing them into the top of the batter. Bake for 1 hour to 1 hour and 5 minutes or until a tester inserted in the middle comes out clean, shielding with aluminum foil after 50 minutes to prevent excessive browning (I missed the tip about the foil and my edges were well done so I strongly recommend doing it.) Cool in pan on wire rack, placed over a baking sheet, for 10 minutes; remove from pan to wire rack. Bring butter and brown sugar to a boil in a medium, heavy saucepan over medium heat, stirring constantly; boil 1 minute. Remove from heat and spoon over top of bread. Let cool completely. Store in an air-tight container.